i hope you had a HAPPY THANKSGIVING, EVERYONE! but more importantly, i hope you know how much i LOVE you. yes, you all, my readers! spiking up my stats! raising up my levels of excitement! and though you may be less in numbers, you are no less dear to my heart, my commenters! you witty, kind, sassy, loyal, smart, dedicated beings! exclamation points all around! CAPS LOCK! seconds!! and thirds!!! WHEEEE!!!! go eat leftovers, drink more wine, and be merry! This entry was posted on November 26, 2010 at 8:00 am and is filed under feelings. You can follow any responses to this entry through the RSS 2.0 feed. You can leave a response, or trackback from your own site. 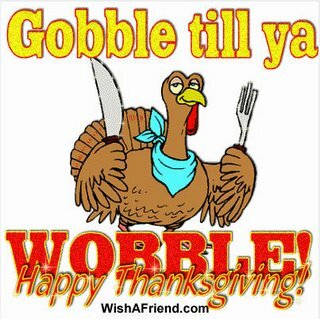 I’m still wobbling from all my gobbling, and intend to lie low and avoid any traditional Black Friday shopping like the plague. I’m sure the leftovers will start looking pretty good later today. i am, indeed, wobbling all around and i am loving it! speaking of leftovers, a turkey sandwich is calling my name. good thing i talk turkey! i am being so merry i don’t need a belt for my jeans anymore! ugh. it’s exhausting, eating this much. i hope you are having a blast, and thank you for the great blog and for the general awesomeness! I too am hitting never before reached levels of food comas. Zzzzz. Sorry, was in one just now. Anyways, I am also grateful for your bloggy goodness. keep it up!